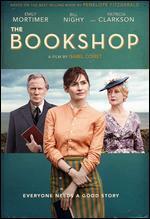 Emily Mortimer; Bill Nighy; Patricia Clarkson; Hunter Tremayne; Honor Kneafsey. New. Run time: 113 mins. Language: English. Patricia Clarkson, Bill Nighy, Emily Mortimer. Good. 2018 Run time: 114. Connecting viewers with great movies since 1972. All used discs are inspected and guaranteed. Used discs may not include digital copies. Customer service is our top priority! Emily Mortimer, Bill Nighy, Patricia Clarkson, Hunter Tremayne, Honor Kneafsey. Fine in fine packaging. Language: English. Run time: 113 mins. Aspect ratio: 1.78: 1. Originally released: 2018. Based on Penelope Fitzgerald's acclaimed novel, THE BOOKSHOP is an elegant rendering of personal resolve and the battle for the soul of a community. Patricia Clarkson, Bill Nighy, Emily Mortimer. New. 2018 Run time: 114. Buy with confidence-Satisfaction Guaranteed! Delivery Confirmation included for all orders in the US.